Local NHS employers are to implement more rigorous sickness absence management standards as a result of a new national agreement1 reached with the trade unions. The new framework agreement, which came into effect in April after two years’ discussions, forms part of a wider package of measures on ill‑health retirement and absence management. 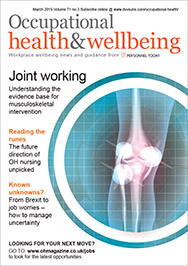 Changes to ill-health retirement arrangements are likely to expand the role of occupational health professionals and medical advisers working in the sector – for example, requiring them to advise on long-term ill-health cases and to make decisions on which level of the new-style ill-health pension retirees will receive. The agreement was informed by a wide-ranging review of current practice, which aimed to identify clear processes for handling sickness absence, rehabilitation, redeployment and ill-health retirements in the NHS. The minimum standards set out in the agreement form part of NHS national employment terms and conditions and cover the employer’s legal responsibilities towards staff under health and safety, disability and discrimination legislation. The agreement sets out key employer behaviours for the effective management of absence and contains a clear statement on the value of a healthy workforce in providing quality health services. The role of employees in maintaining their own health is also noted – the agreement states that employees have a responsibility to work with employers to manage absence and explore options for their own return to work. data collection and policy reviews: the value of collecting good-quality, robust data on sickness absence is stressed, as well as the need for regular review of policies covering absence. The agreement on sickness absence runs alongside new arrangements for ill-health retirement pensions awarded from the NHS Pension Scheme. In future, two tiers of early ill-health benefit will be paid, based on member’s degree of incapacity. For example, lower-level tier 1 benefits are paid in cases where an employee is assessed as incapable of performing their NHS role, but is likely to be able to perform other “regular work” before pension age. Higher-level tier 2 benefits are paid in cases where employees are assessed as permanently unable to carry out any regular work (apart from therapeutic or voluntary work). Medical advisers will be the key decision-makers on which benefit tier retiring employees fall into, and whether movement between the tiers should take place once benefits are in payment. Three-quarters of applicants for medical retirement under the new arrangements are expected to receive the higher-level tier 2 benefit, with the remaining 25% falling into tier 1, according to a study carried out by the NHS Pension Scheme’s medical advisers as part of the review. The trade unions and employers have agreed that the guidance detailing the medical and application processes for future ill-health applications will be agreed in partnership and made publicly available “to ensure openness and transparency”.